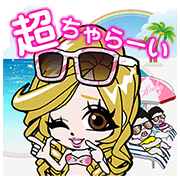 http://www.line-stickers.com/ – Rola’s Talking Stickers Line Sticker | Rady presents stickers that will add an unmistakable fashion-gal feel to your chats. Rady is responsible for some of the raddest fashion on the market AND the hippest gal paraphernalia around! These miracle workers are back with a new galled-up round of stickers, so set your chats on fire with these CHO very good designs! Friend Radyʹs official account to get them. Get ready Rady’s third sticker set! This time these rad ladies are talking, so send them to besties and boyfriends alike for lively chats! Friend Rady’s official account to get the set. Available till June 8, 2016. The sound for these stickers will play on iPhones even if your device is set to silent mode.